To be honest I didn’t expect to be writing on of these for this game after the first couple of hours - the game just didn’t grab me the way I thought it was going to. However as I’ve spent more time with the game it’s charms and flaws (and it does have its flaws) are evident and hard to ignore. After ten (and some more) hours I feel like I’ve gotten a good handle on the game so here are some assorted musings and impressions of the fifth Star Ocean. Jason over at Kotaku has already written pretty extensively about this and the camera’s effect on him. I personally wasn’t expecting as much of an issue and I was correct - it’s not nauseating for me anyways. However it is a noticeable annoyance. The issue seems to be that the camera is locked to a particular point behind your character. However the terrain is often a bumpy one so moving up and down on the field can make the camera jumpy. Add to the fact the game runs at 1080p and 60 FPS it can be a little off putting at first. I’ve found though as you spend time with the game you grow used to it, that being said the fact you have to grow used to it is unforgivable. This should have been addressed pre-release well before launch. It’s possible this may be a personal issue, I’m not completely sure. However moving around on the field feels halting at times. When pushing hard down on the control stick your controlled character will sometimes just stop moving as if he’s about to run into something. This also occures when trying to make sharp turn, sometimes even a basic turn. It’s strange but moving requires a light touch often seemingly not suited for my controller handling. While it’s not a game breaking issue, it’s odd to say the least. As I’ve never seen an issue like it in literally any game before. My personal theory is that is a holdover over from the PS3 during the porting process, as when I play via remote play on my Vita there is no issue. This is an instance where if anyone has any information let me know, as it’s the most glaring issue outside the camera for my play through. This could be a big turnoff for some JRPG fans as it was in Japan. This game is FAST. In the span of ten hours events that would have taken Star Ocean IV: The Last Hope 25 hours have transpired. One big change is the sparsity of cut scenes, where earlier entries would drop cut scenes with abandon even for mundane things, this renders these scenes in engine. Funny enough some times they will actually spill over into battle. It’s humorous with battles raging and particle effects flying where characters are having conversations about pet lizards. Of course this doesn’t make things bad as the content is still there. Just a lot of it is optional, I can see one finishing the main game in perhaps as few as 30 hours if they tried. Myself I’m likely looking at 75 hours for a near 100% run. If you’re protective of your giant JRPG’s - don’t worry Tri-Ace didn’t abandon you its just that they didn’t force everyone to play that way. Note: Here I would say this game will seem disappointing if you don’t do the side quests as they unlike A LOT of features. For JRPG’s the localized dialogue of which almost everything main is voice here is key. I’ve got good news! Star Ocean IV and Infinite Undiscovery this is not, the game is actually well localized and voiced. As the voice talent used is actually quite experienced and fits the characters they’re cast too. I’ve heard voices from Square, Tri-Ace, and the Neptunia series. If you were worried about the “M’kays” from IV you can rest easy. That being said some script choices are ripped straight out of Star Trek, so much so I’m convinced somebody on the localization team is a fan. A large amount of particular characters early tensions is not breaking a Prime Directive like interstellar law, or calling down a barrage of photon torpedoes. For fans of Star Trek such as myself it’s kinda fun. It’s also neat as in this case you play as the other side, you are the undeveloped denizens of the invaded world where the far advanced peoples are messing with your world. The battle are chaotic. With upwards of six allies and your controlled character they can often be a test of understanding as much as mettle. This is tempered by the fact that generally speaking your characters are well balanced for their own particular roles, while it is entirely customizable, I would say it’s smart to keep them pretty close to their natural dynamic. As with it it produces a very interesting almost MMO style raiding party with a heavy attacker, lighter(er) attacker, a ranger, a buffer, a defender, a healer, and a black mage. Basically for the first time Star Ocean V doesn’t force you to choose who is your favorites and just gives you tools to play around with. The results can be spectacular. Especially as the game takes full use of the PS4's power allowing for smooth controls and frame rates no matter how many blasts are going off at once. Furthermore there really is no build up to these great fights as they start right off the bat. Unlike most JRPG’s where its a tale of a scruffy youngster learning to become a master, you start as a master if not THE master. Every fighter in the main party makes sense being there based on their skills in battle and personal background. There is no “Why are we entrusting the safety of the galaxy to children” here. New to Star Ocean V is the ability to customize the AI of each fighter in a more simplistic version of the gambit system from Final Fantasy XII. The “Role System” is the main vehicle of strengthening your characters stats alongside leveling. However its much more important to note it also determines your characters actions and how they approach battle. Too many defensive skills and one may be a statue hard but unmoving, while too many attack skills and they’re a glass canon. The key of course is balance, with each character as I mentioned having a particular role that suits them nicely. Although it is an open system where you can mix and match as you will which I often do. Leveling is actually kinda insignificant in the grand scheme of things. With levels coming so easy I can really see people hitting the level cap depending on where its placed in a single play through if you’re doing the extra content, which again is recommended. This is especially easy if you’ve gotten the Day 1 DLC offered in first run packages which grants bonus 20% experience. This seems to be a continuation for Tri-Ace as recent games from the developer have continued to reduce the importance of hard level grinding. 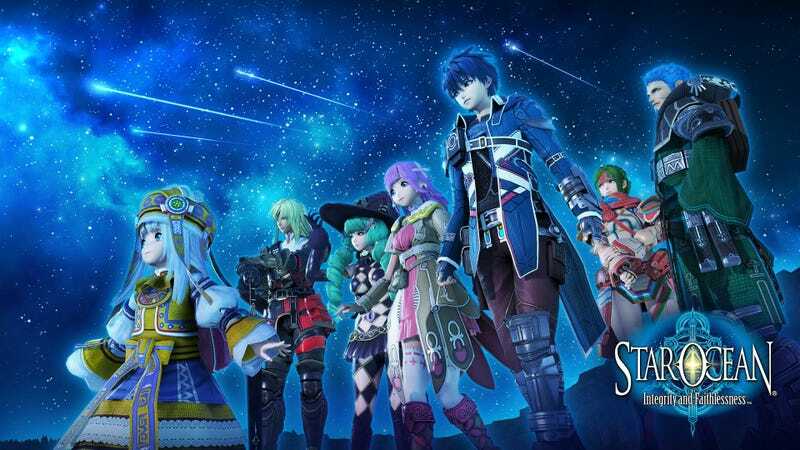 Star Ocean V forces you if you grind to grind smarter then other games, as continually fighting in the same area will achieve results they will just be slower then if you vary things up and keep moving. Especially to where the quests are located. Furthermore as the story progressive stronger enemies appear so earlier areas remain entertaining and fresh and a key source of crafting materials through the entire game. One last thing that needs mentioning is this game can go one of two ways moderately difficult or cake walk easy. As I’m playing the game the way a JRPG is meant to be played its cake walk easy. Seriously if you haven’t started playing, start on Galaxy Difficulty when prompted. Earth Difficulty will be too boring for most JRPG players and anyone with simple understanding of action game play. I fully expect the game was designed to played multiple times before the true experience for veteran players is unlocked. This allows the game to be both experienced by veterans and new players alike even if more work is required of fans for a true challenge. Which makes sense considering that was the entire point of designing this new entry - accessibility. This is one thing you’ll notice right away some designs seem off... Miki’s in particular looks like a porcelain doll, while others look relatively normal. I’m not quite sure what made Tri-Ace say yes to her design in game as the character art looks perfectly in line with the rest. Other examples of odd choices have to be Fiore who’s wears a skin tight patched body suit designed to show off maximum amount of skin. For a game that supposedly went through “Censorship” for both the Japanese and English versions of the game it’s kinda hilarious they basically leave a pinup cosplay model the way things are (she has fake wings and a tail...). If you’ve played any Star Ocean game you’ll know the lovably eccentric, oddly immortal, and likely Fourth Dimensional Welch. Unsurprisingly she makes a repeat appearance in the fifth installment as a VERY important character this time around. While unimportant to the main story, in fact she’s totally skippable, it’s unwise to do so. You see she is the source of the quests to unlock the specialties for crafting every item. If done properly (especially the Synthesis ability) you can unlock very powerful weapons and armor early on making your party virtually immortal. Furthermore her character is one of the most entertaining in the game, for a game full of very serious people, Welch is often a breath of fresh air whenever you see her. As always thank you for reading. If you have any other thoughts regardless of where you are in Star Ocean V let me know in the comments. Furthermore if you’re on the fence about this game while this isn’t meant to serve as a review I feel I have a good grasp of the game and I’d say it’s worthy of most JRPG fans time. Even if it’s not perfect there is worse ways to spend your time in these dog days of summer and as one of the most accessible JRPG’s in years it doesn’t even need to be that onerous.